Morning! Sunrise in Siberia. I have made the switch from Moscow time to Beijing time. Its a 4 hour difference and an ongoing issue for the Trans-Sib adventurer. The train schedule is in Moscow time and does not change until the Mongolian border. However the daylight, and vitally the restaurant carriage, operate in a local time. There is no perfect answer but I have made a full jump to Beijing time leaving one watch on Moscow time just so I can read the timetable properly. The reason for doing this is that I slept through much of Mongolia last trip, and want to wake up as we arrive into UB early in the morning on Sunday. 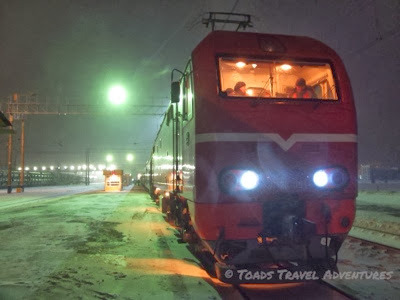 So I woke up today after a night of mixed sleep as we pulled into Krasnoyarsk at 06.24 Moscow time, 10.24 local time. I’m not quite sure what was going on, as there was no coal to load. That makes the stop a high risk strategy for the tourist, as with no coal going on there is also no indication of how close we are to departure. I think I got yelled at yesterday as we got ready to depart and I was taking a photograph on the platform. In Chinese there is no perceptible sound of urgency to the foreigner – or in fact everything sounds urgent. The guard might have simply been saying “Lovely view from this platform in the soft morning light, have you tried F2.8 with a longer exposure?”, but it sounds like “Quick! Climb up now you fat foreigner or you will be left behind in this icy cold place forever!”.. 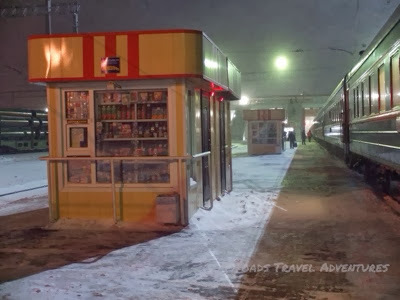 I took a stroll up to the front of the train at Balabinsk last night – it feels like a long walk, and up at the front there is just you and the crew, no guards to shepherd you back to safety. Anyway for the trainspotters amongst you, as you can see, we have been pulled by a fairly modern Russian locomotive for the past 24 hours. Please don’t ask me to tell you what type it is, as I don’t know, and even if I did I know, I would pretend not to.. The shops here were plentiful, but no big brands, odd sizes or refunds..
On board carriage 9 everything is working well – a minor flood in one of the showers (yes – en suite showers or sorts here in first class) and the toilet drain has frozen, but otherwise all good. If you read my 2012 blog you may have heard about my carriage guards, named by me as “Guard A” and “Guard B” – both helpful, but quite different in their approach. On this train I will call them “Mr Blond” and “Mr Green”. 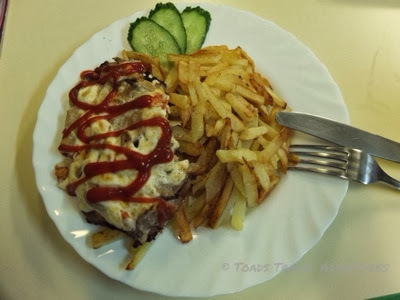 Mr Blond is a jovial and friendly person who actually speaks a little bit of English. Mr Green, his opposite number, is in hiding most of the time and sits quietly reading and texting a lot from his compartment. He is covering the night shift. When I went to stash some white wine in the icy space between the carriages last night, Mr Blond spotted this and insisted that he store it in the guard’s kitchen fridge, which was good of him. Anyway I have given them both a small bottle of Johnny Walker and all seems well. As I write this they are making some rather fine looking dumplings for their own breakfast, which look far nicer than anything on sale in “Little Russia”. 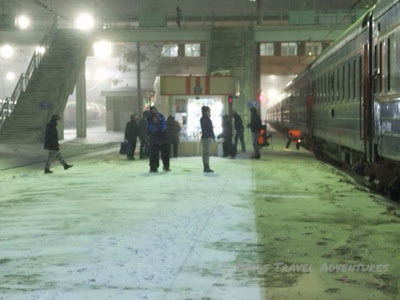 I retired to my compartment after an early dinner last night (very passable Schnitzel, but as Alan Partridge would say, “the tomato sauce should be my decision”..) and watched out the window as tourists played in the snow and Russians chain-smoked cigarettes. I think that’s all for now. Thanks for stopping by and hope you find my posts of interest. Please feel free to comment below – you don’t have to log in to do this as I have changed the settings. Loving the blog, did the same journey on the Trans Mongolian in September this year and the photos and text are bringing back a lot of great memories. Great stuff. Scott – how was the weather in September? Windows open? Busy train?